Calibration in FilmQA Pro is carried out using a single scan of 3-5 exposed film strips and an unexposed film. Fitted calibration function have only 3-5 parameters and additional calibration patches are not necessary. This instruction set is using the images of the RapidArc example that is part of the installation. 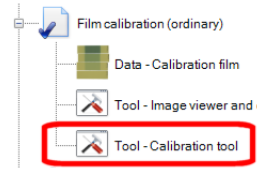 Add a “Film calibration (ordinary)” object to your case. 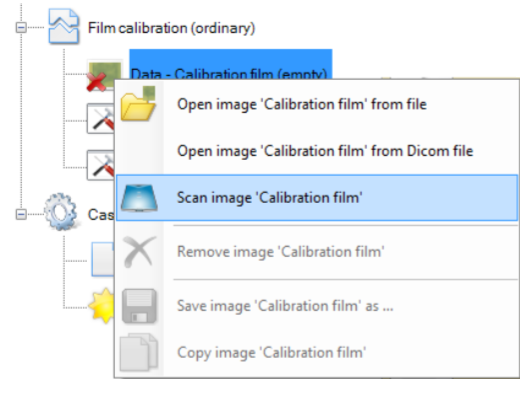 Acquire the calibration image by either reading it from a file or scanning it directly. 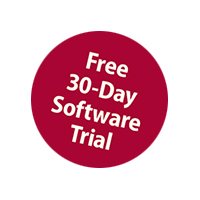 Tip: To move a RoI, select it and either drag it with the mouse pointer or use Ctrl+Arrow keys. To move All RoI at the same time use Ctrl+Alt+Arrow keys. To delete a RoI, select it and press Del key. 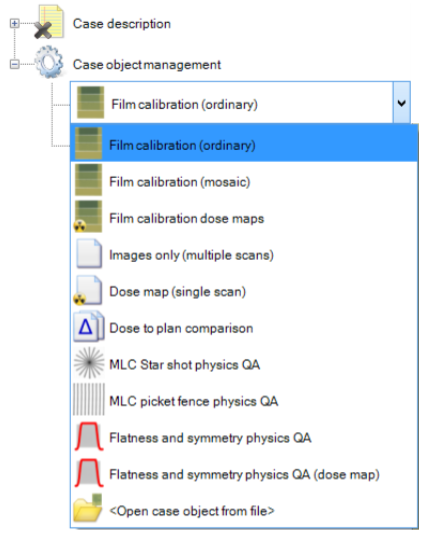 Select the calibration tool in the "Case data selector" as shown below. 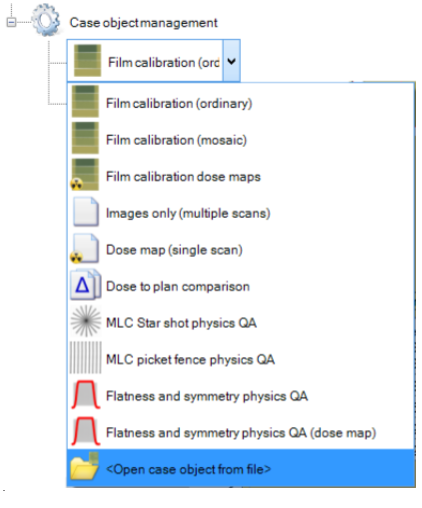 Enter the calibration dose values in the very left column of the calibration table. Tip: Measurement unit can be changed by right clicking the column header. Tip: One can copy and paste dose values by right clicking the dose column and select "Paste to dose colum starting at ..." . Each installation example includes a text file "Exposures.txt" with the used dose values. 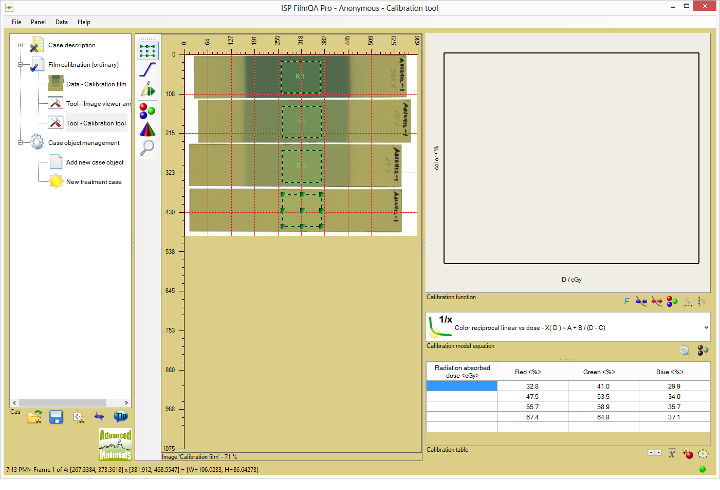 After entering All dose values in the calibration table (all rows are completed), the calibration functions are correlated automatically and both the fitted function and the calibration data are displayed as shown below. 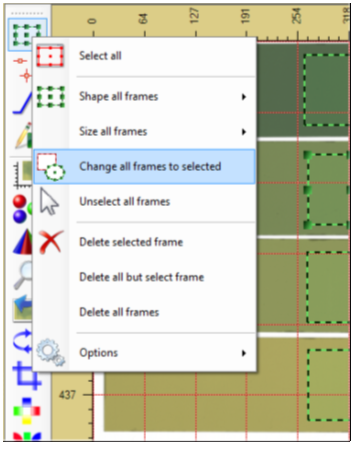 Tip: The fitted function parameters can be displayed using options available at the button. The consistency map allows to estimate the dose error for any color pixel converted into dose. A calibration can be optimized by minimizing the dose error across the RoI of the calibration patches. 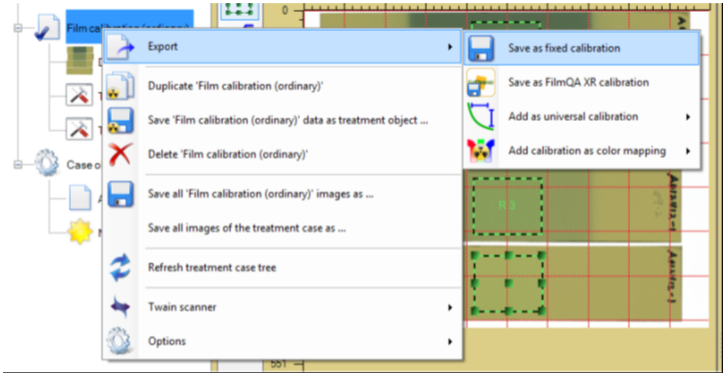 If the calibration is Not consistent with the correlated calibration function, one cannot expect that the patient film is consistent with the calibration. The dose offset of the calibration function values for the color values at the calibration table is Not a measure for the quality of the calibration. Click the button to display the consistency table as shown below. This table includes the consistency across the RoI. Lower consistency values means smaller dose error. The RoI can be adjusted in size and location to optimize the consistency—click and drag the RoI to adjust and all values are updated in real time.